The first time I had Mizithra cheese was at a restaurant in Oregon (eons ago). I believe I was in high school and they served it over broccoli with brown butter and this cheese. I fell in love immediately with it. Since this first experience, I have traveled and moved often. We don't always find this cheese with every move-- but-- I did last week while my sister was in town. Whole Foods has this small basket of remnant cheese ends for a great price. I like trying out new cheeses and this is a great way to experiment with new flavors without spending a small fortune. They will run between $2 and $4 dollars. I believe we both reached for the cheese when we saw the beginning few letters on the packaging. We both knew immediately what it was. Our faces broke out in grins a mile wide. Happy bellies were on our horizon. The problem was that we already had so much food in the fridge that we never got around to making it while she was here. 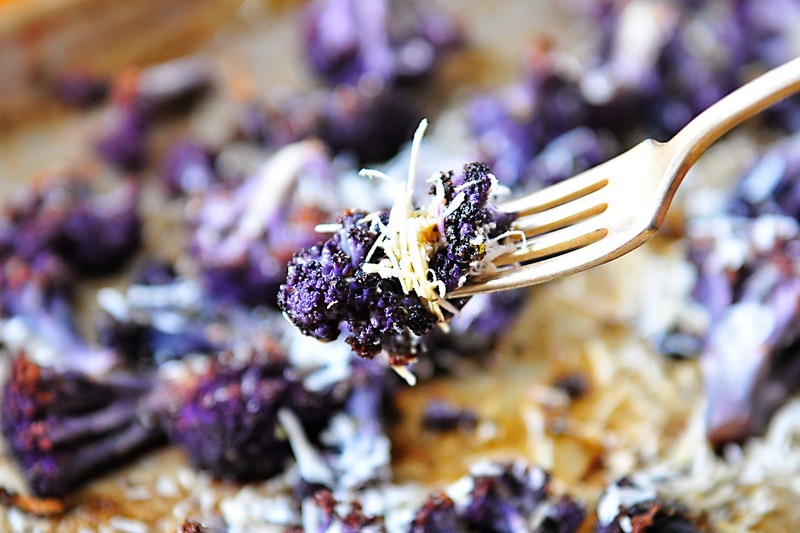 The purple cauliflower would not last long so I roasted it the next day, used the left over browned butter from our raviolis and blanketed a thick layer of grated Mizithra cheese over the top. My mouth and belly did a happy dance. This recipe is so simple but the flavors are amazing and so I wanted to share it. 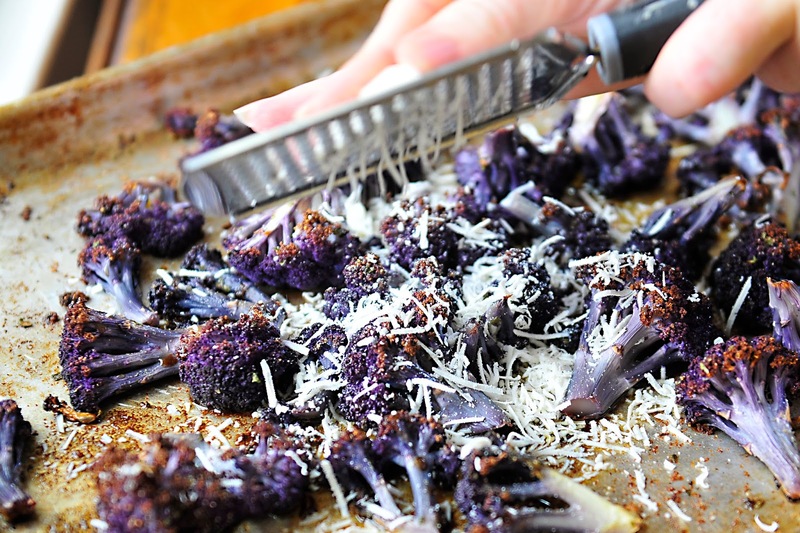 Purple cauliflower is not necessary but it does make for a beautiful dish. My sister will have to do with a few pictures or venture out on her own and make it for her family. I hope she does the later because it is well worth the culinary experience. 2. Prepare cauliflower by washing and cutting the crown into pieces. In a bowl, toss the salt, pepper and olive oil to coat the cut pieces. 3. Spread on a cookie sheet and roast for 30-45 minutes. I cooked mine longer because I like the little browned edges of the cauliflower. It adds texture to every bite. Every oven is different so start checking for color and doneness at 30 minutes. 4. While the cauliflower is roasting, I will make the browned butter. I do this by placing the softened stick into a small saute pan and turning the heat to medium high. The butter will melt and start to foam. Then you will see it turn from a golden color to a light brown color. It will also have a nutty aroma to it. You must watch this the whole time because it happens quickly and you don't want it to burn. When I start to see the browned specks in the bottom of the pan I give it a stir or two and turn the heat off. It will continue to cook a bit in the warm pan. I will transfer it to a cool bowl if I don't use it right away. The browned butter stores nicely in the refrigerator. When I need a spoonful I just break off a chunk and melt it in the microwave. 5. 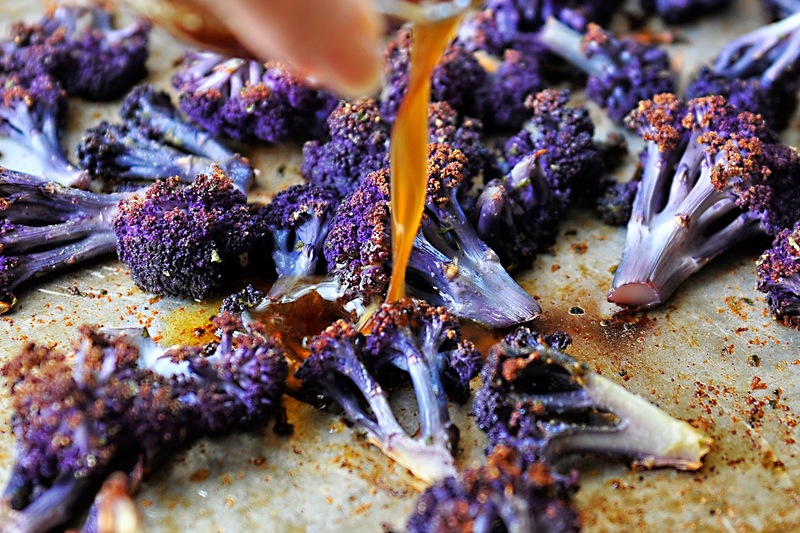 When the cauliflower is to your liking, remove from oven and pour browned butter over the top. 6. Add the Mizithra Cheese. That heirloom cauliflower is beautiful! What is the flavor profile of the Mizithra cheese? I'm so intrigued now! Hi Baker Bettie--For me, the flavor is the same just a different color. Thanks for your comment. 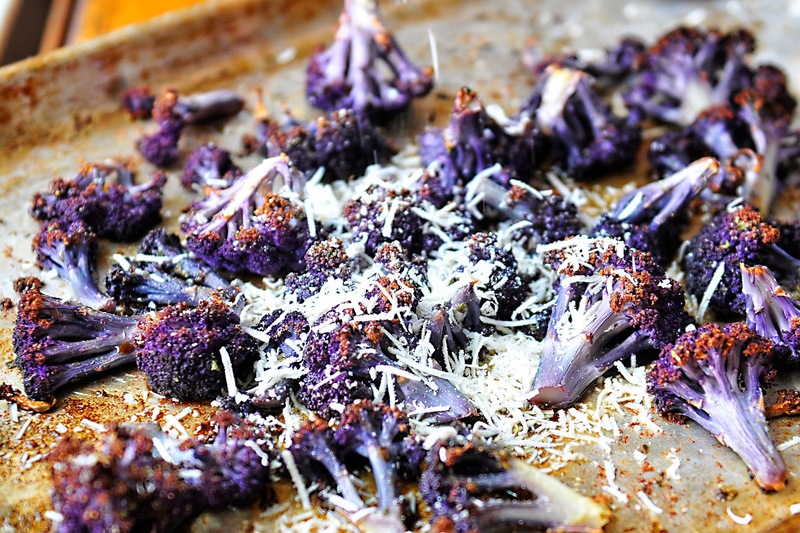 I'm just about to do a post using the purple cauliflower from Whole Foods! How funny! It's so incredibly pretty! Tonight I had corn (roasted on the cob, then cut off) with brown butter and mizithra cheese. OMG!!!! !